A hierarchy of the arts was born when theorist André Félibien spouted grandly in 1667: "He who produces perfect landscapes is above another who only produces fruit, flowers or seashells." The great European academies soon had it all wrapped up. The job of art was to "render visible the universal essence" of things rather than merely copy them. At the top of the hierarchy were the heavily moralistic historical paintings, followed by heroic portraits. Landscape painting was somewhere in the middle and poor old still life was right down at the bottom of the pile. Bowl of fruit anyone? Still life has always carried that lowly stigma - and popular culture equates it to. . . well. . . boredom. That said, some still life paintings of the 17th-century Dutch Golden Age packed a strong moral punch. The most dramatic of them interspersed the traditional flowers and fruit interspersed with fatalismo like human skulls. You don't need to be an art historian to decode this one: a skull is an obvious symbol of mortality and a snuffed-out candle says the same thing. So does a withered leaf, a rotten grape, or insects burrowing into the fruit. A mirror is a symbol of the vanity of earthly pleasures and an hourglass is a subtle reminder of the passage of time. The inference was that, by drawing attention to the impermanence of life, the painting would focus the mind on the hereafter. These became known as "vanitas" paintings, referring to that great biblical quote "all is vanity" (Ecclesiastes 1:2) but ultimately they failed to convince the art critics that a painting of humble objects could communicate big ideas. Still life remained a lesser genre and its painters were described as "the foot soldiers in the army of art". This was good news for the punters - the subject matter of a painting had a direct relationship to its price. Less so for the artists. If you wanted to paint in a lesser genre, you had to settle for a lesser price. Now, the price of a painting is determined by the reputation of the artist rather than its subject matter. A still life painting won't necessarily cost less than a landscape by the same artist. And some still life paintings can sell for very big money. Of course you'll find Irish auctioneers getting excited about still life paintings by Roderic O'Conor (1860-1940). "He'd be the best of them," says Rory Guthrie of de Veres Art Auctions. "A good Roderic is still worth a lot of money and you could pay up to €100,000 for a really good one." It's not surprising - O'Conor's paintings are luminous, dynamic, and very much not the academic exercise that still life is so often accused of being. If you have one, you'll probably want to keep it. A painting by Norah McGuinness (1901-1980), Still Life with Strawberries on Garden Table, doubled its guide price in December 2014 when it sold at Adams' auction of Important Irish Art for €20,000. Peter Collis (1929-2012) also does well at auction. His Still Life with Powder Pot sold for €1,600 at the Adams' Paintings from the ESB Collection auction, also in December 2014. The upcoming de Veres Art Auction includes Still Life with Artichokes by Pauline Bewick (b 1935) and Japanese Pear by Charles Brady (1926-1997). Each of these is estimated to sell for between €2,000 and €3,000 on February 24 at Bewley's Ballsbridge Hotel. Brady's work - recognisable, simple, and often dealing with a single item rather than an elaborate composition - is particular popular and his paintings have been known to sell for between €3,000 and €5,000. "Still life wouldn't set my heart racing now," says Guthrie. "You're dealing with a very academic theme. At the end of the day it's all about the skill of the composition and the brushwork. Every collection has to have one but I don't think I'd ever want a room full of them." Still life tends to be a quiet genre and easy to live with. Big ideas are all very well in a gallery, but they can be less comfortable in the living room, where flowers and fruit work just fine. The bottom line is that artists still want to paint in the genre, negotiating its legacy as a lesser art with panache. Some of the Irish artists making interesting work in the genre include Martin Mooney, whose Still Life in Blue (2014) sold at Adams for €1,600 in December 2014 and Conor Walton who plays with the symbolism of "vanitas" painting in a contemporary way. 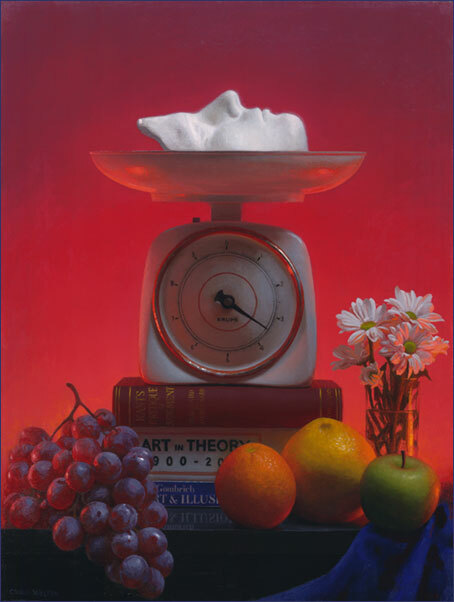 Still Life with Judgement XI shows a death mask on a kitchen scales, on a pile of art books, along with photorealistic fruit and flowers. Much to think about here! Walton's prices range from €1,000 to €20,000 depending on the size of the work. Nick Miller, whose exhibition runs in the RHA until April 26, prefers the French term for still life "nature morte" and his work shows a gentle interpretation of the genre's underlying themes of death and decay. His current work has roots in his collaborative project at North West Hospice, when he brought in flowers, as is traditional when visiting the sick, and painted them in a temporary studio on the ward. Sometimes this led him to engage with the patients, painting portraits and interiors as well as flowers.